• MAXIMIZE YOUR VEHICLE'S CARGO SPACE, You Deserve to have a Car Storage Solution that is Easy to Use and Folds conveniently and compactly when not in use. You can Store Suit cases, and Camping essentials. • TRAVEL WITH PEACE, whether you're planning a Cross-Country trip or you're in the mood for a little Off-Roading, our roof top carrier is ready for any adventure! 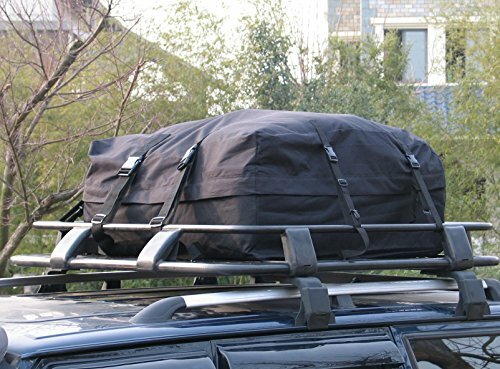 • A MUST HAVE, this Roof Top Cargo Carrier is constructed out of Heavy Duty 600D Polyester Material with PVC Coating, perfect for Cars, Vans, SUVs, and Trucks. • DESIGNED TO MAKE YOUR LIFE EASIER: Whether you are a professional who needs extra Space or you are organizing fun getaways with your family, our Roof Top Carrier is an Essential Car Accessory for you! everything can fit into this Carrier without hassle and frustration! • A GIFT THAT SPREADS SATISFACTION: If you happen to someone who has lots of stuff when traveling and in need of some space saving car organizer, or if you just are on the lookout for the most practical gifts, consider your quest over! • WATERPROOF SEALING:100% Waterproof with Dual Seam Technology and zipper flap; Sewn for Strength/Welded Waterproof, Protects cargo against road grit, sun, wind and rain. • MATERIAL, Polyester fabrics with waterproof PVC coating inside and outside, a double-flap and 8 Velcro's covers the zipper. Ensure the waterproof edge down, clinging to the bag to keep water out. • VERY EASY TO STORE AND INSTALL: The foldable material used to make this car cargo bag means that it folds away easily and only uses up very little space for storage. It is equally easy to install. • STRONG, WIDE STRAPS: To ensure that everything stays in place even when the road gets rough and bumpy, this cargo carrier waterproof bag has strong, wide straps that hold it in place. Extra fabric with Velcro also covers the zipper in heavy rain. • LIMITED LIFETIME WARRANTY. Buy It Now with Confidence. MAXIMIZE YOUR VEHICLE'S CARGO SPACE, You Deserve to have a Car Storage Solution that is Easy to Use and Folds conveniently and compactly when not in use. You can Store Suit cases, and Camping essentials. INCREASES CARGO SPACE, you get an additional 10 cubic feet of storage space to carry extra luggage. Its soft material makes it perfect for carrying oddly shaped cargo thus creating additional space in your car. TRAVEL WITH PEACE, whether you're planning a Cross-Country trip or you're in the mood for a little Off-Roading, our roof top carrier is ready for any adventure! DESIGNED TO MAKE YOUR LIFE EASIER: Whether you are a professional who needs extra Space or you are organizing fun getaways with your family, our Roof Top Carrier is an Essential Car Accessory for you! everything can fit into this Carrier without hassle and frustration! A MUST HAVE, this Roof Top Cargo Carrier is constructed out of Heavy Duty 600D Polyester Material with PVC Coating inside and outside, perfect for Cars, Vans, SUVs, and Trucks. WATERPROOF SEALING, 100% Waterproof with Dual Seam Technology and zipper flap; Sewn for Strength/Welded Waterproof, Protects cargo against road grit, sun, wind and rain. A GIFT THAT SPREADS SATISFACTION: If you happen to someone who has lots of stuff when traveling and in need of some space saving car organizer, or if you just are on the lookout for the most practical gifts, consider your quest over! LIMITED LIFETIME WARRANTY. Buy It Now with Confidence. If you have any questions about this product by beorganize, contact us by completing and submitting the form below. If you are looking for a specif part number, please include it with your message.